In the trend of integration and internationalization of higher education, through intensive cooperation with hundreds of universities, organizations of education, science and technology around the world, the University of Danang (UD) has developed advanced programs, high quality programs, joint training programs and agreements on teaching staff and students mobility. By this way, students have the opportunity to study and develop their innovation potentials. UD and its members have also implemented policies to attract more and more leading scientists and experts in the fields and specialties to teach at the University. The teacher not only has good knowledge but also inspires students to find the motivation and the path to success. From 2016 until now, the lecturers and students of the Danang University of Economics have been quite familiar with the image of Prof. Darren Henry (Australians) on the lecture hall. The professor is always welcomed by students and his office is also fully scheduled with appointments for professional advices. Professor Darren Henry is currently Dean of Finance, La Trobe University (Australia). He came to Danang under a cooperative program with the Danang Universityof Economics and carried out a number of activities such as co-research in scientific projects and co-authors in international publication with faculty members of Finance; teaching support, scientific research consultancy through seminars at the Faculty. Dr. Dang Huu Man (Faculty of Finance, supervised by Professor Darren Henry at La Trobe University) added that from 2016 to now, Professor Darren Henry together with the teaching staff of Finance Faculty published 6 articles in international journals ISI (Institute of Scientific Information, USA). His lessons inspired students with a new perspective on experimental research in financial matters and his presence at the UD made it possible for professors to intensively study in finance. Meanwhile, Assoc. Prof. Fabien Ferrero (University of Nice Sophia Antipolis, France) is a lecturer at DNIIT-UD, within the framework of cooperation between University of Nice Sophia Antipolis – member of the Université Côte d'Azur (UNS-UCA), the French Republic and UD. In 2018, Assoc. Prof. Fabien Ferrero came to Vietnam twice and chaired the Technical Jury of the Smart Campus 2017-2018 Competition hosted by UD. 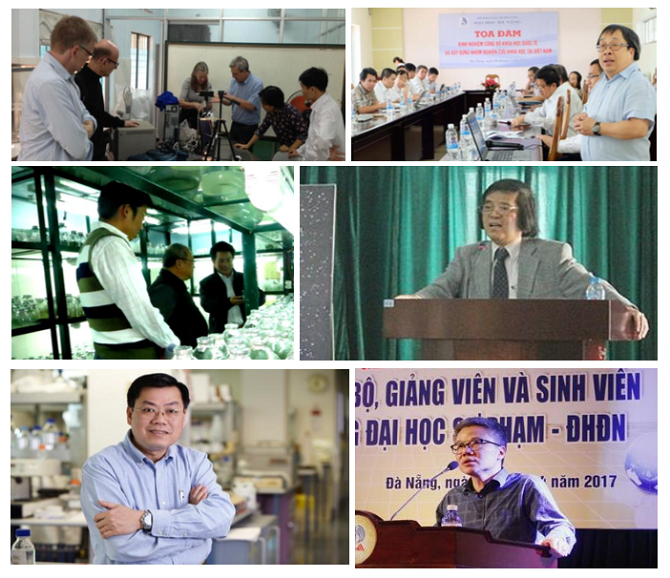 According to Dr. Hoang Hai, Director of International Cooperation Department of UD, in recent time, UD has welcomed many leading professors and experts from international partners to work and given lecture at UD. This opens up opportunities for cooperation, connecting projects on curriculum and research transfer such as Professor Le Thanh Nhan (French-Vietnamese), Prof. Dr. Tran Quoc Tuan (French-Vietnamese), Dr. Le Trong Phi (German), Prof. Marc Daniel (French), Professor Junichi Mori (Japanese), Prof. Hitoshi Yamada (Japanese), Prof. Geoff Parkes (the UK), Professor Helen Griffiths (the UK), Prof. Yulan He (the UK). The cooperation provide students with opportunities to access to teaching and learning methods other than in the country. For example, students of information technology at the Danang University of Science and Technology learn about Information access and receiving(IOF method). Through the experts, students also have the chances to approach foreign companies where specialized professionals are working; If a specialist works in a research institute or university, the student can contact the university or institute to find a place to study or study at a higher level. Teaching staff are also trained in practical experience, in-depth knowledge and professional exchange in foreign languages ​​with specialists. On the university side, strengthening exchanges and learning helps develop collaborative research programs. Those are the international indicators contributing to the ranking of higher education institution and educational internalization.